16 June. 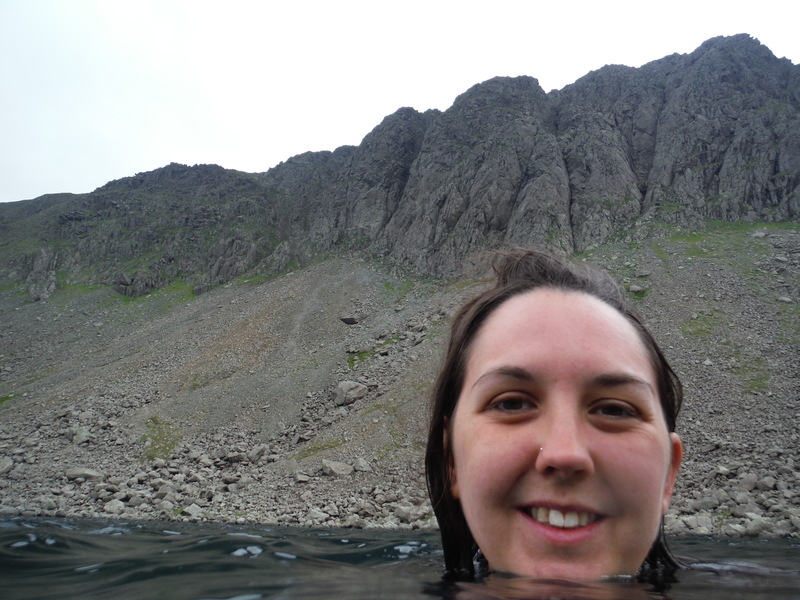 Had my biggest day yet on Tuesday with 4 swims and a very long walk (most of which I did in my wetsuit!). 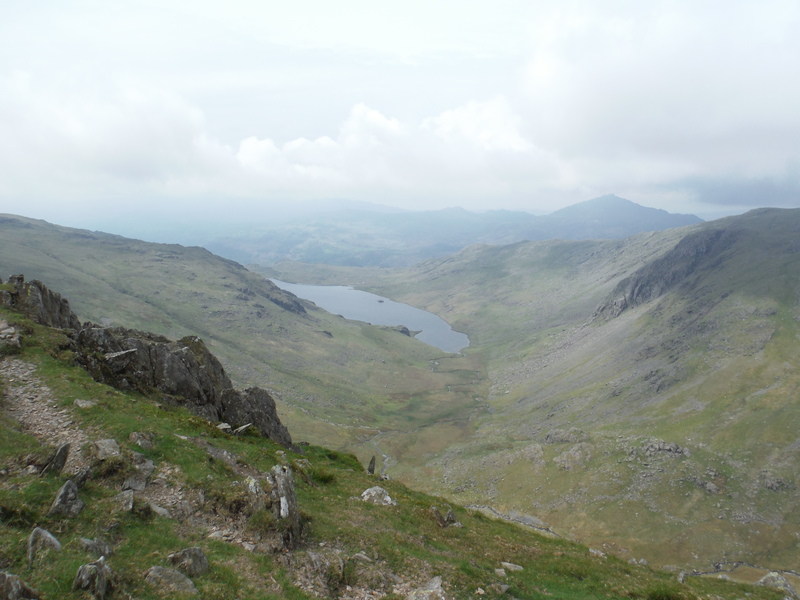 I stayed at Coniston Coppermines youth hostel for 2 nights so I started and finished there. 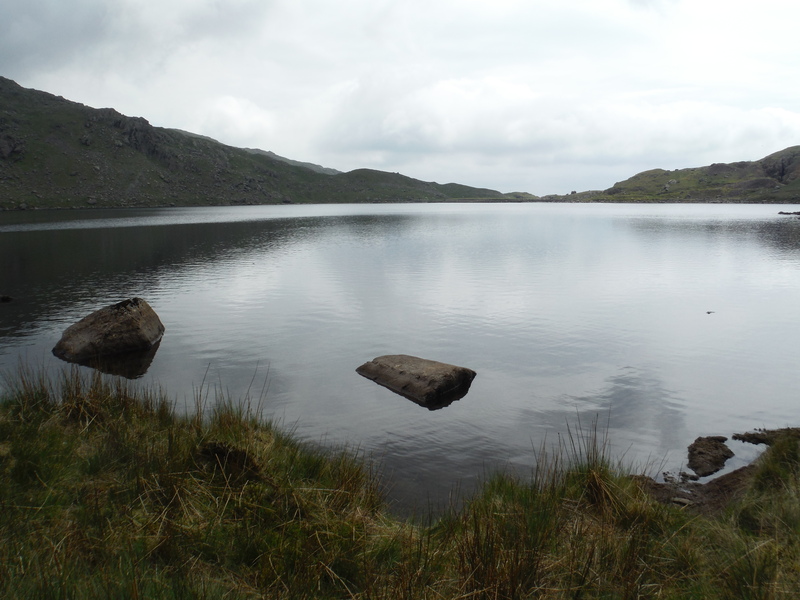 I’d been looking at my map and had chosen 5 tarns that I wanted to swim, taking me on a circular route but 2 of them are reservoirs. I tried Googling them but couldn’t find any information on Lever’s Water. Seathwaite Tarn seems to have a different sort of water extraction to normal so I thought I’d be fine there. 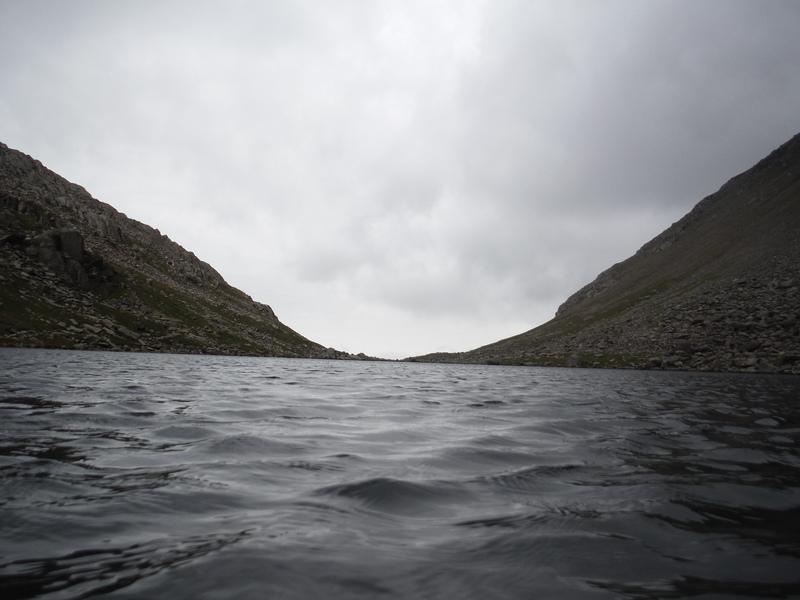 When I got to the hostel I asked Sarah who works there about swimming in both the tarns and she told me that someone had died earlier this year in Lever’s Water swimming too close to the Weir. Swimming in reservoirs is obviously a potentially dangerous thing and I will have to judge each one as I come to it and decide whether or not it’s safe. My walk started up the side of the Lever’s Waterfall which was beautiful but very steep. At the top you are faced with a big stone wall – the weir which holds the water in. Coming from below, this is all you can see of the tarn which is quite weird! Once you come over the top though you get a great view. 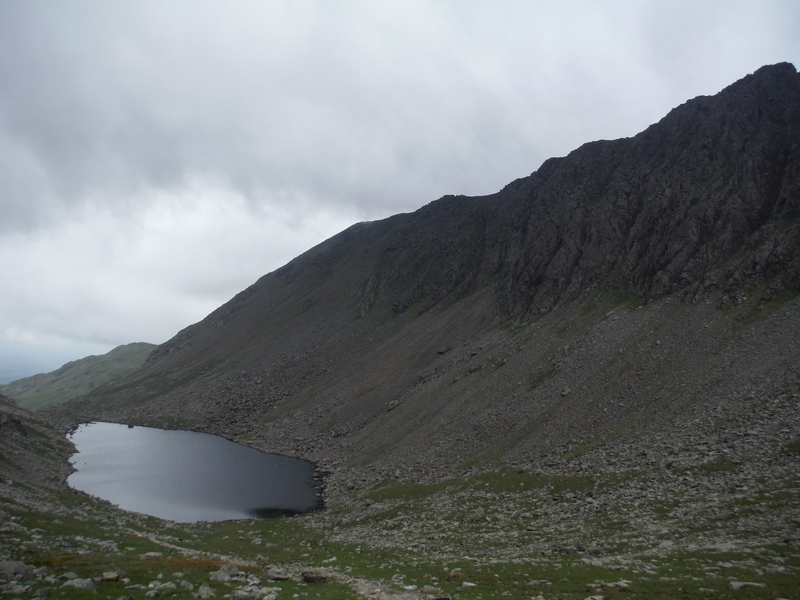 The surrounding scree-covered fells drop steeply into the water which created quite a dramatic effect. Taking into consideration what Sarah had said I decided to swim along the side of the tarn furthest from the weir. The tarn is basically square so I just went from one corner to another, taking care the whole time that I was close to the edge and always well within my depth. It was a good swim, but I was always a little bit conscious of how far I still had to go that day! From Lever’s Water I had a very steep climb up onto a ridge. I didn’t want to keep taking my wetsuit off and on all day, so I just took the top half down and put a jumper over my swimming costume and walked in the bottom half of my wetsuit and wetboots. It wasn’t as bad as I’d thought it might be but I wouldn’t recommend it! From the ridge there should’ve been a path down into the next valley where I could see Seathwaite Tarn. I never found that path. I looked for it long and hard, but I could never find it. 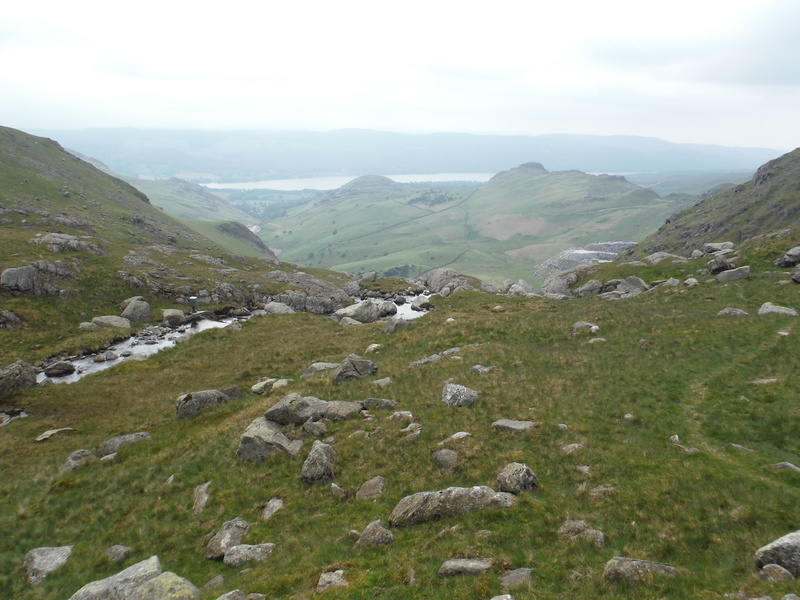 I ended up having to scramble down the very steep slope into the valley and then follow the beck along to the tarn. I have to admit I wasn’t in a very good mood by this point. It was grey and cloudy, the day was wearing on, it had taken me a long time to get down the valley and the tarn looked cold. 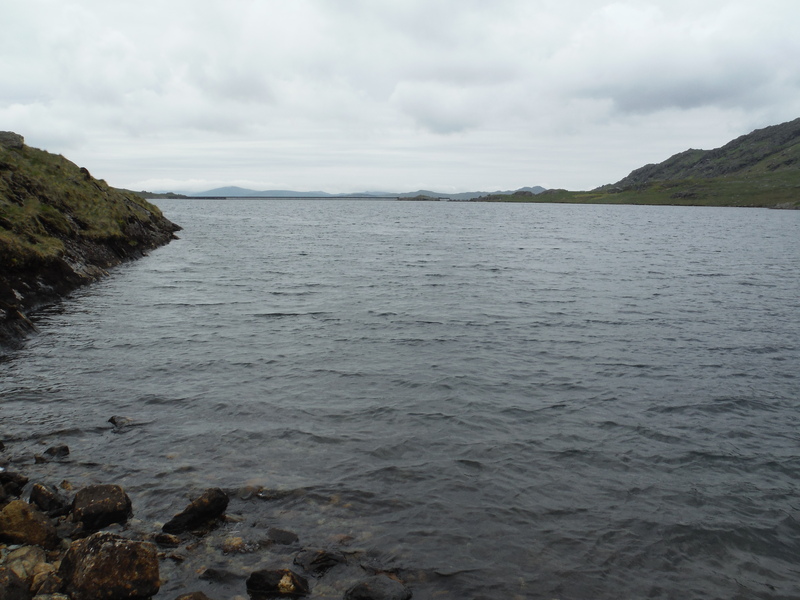 Once again, I decided to swim along the edge rather than across because this is another reservoir. 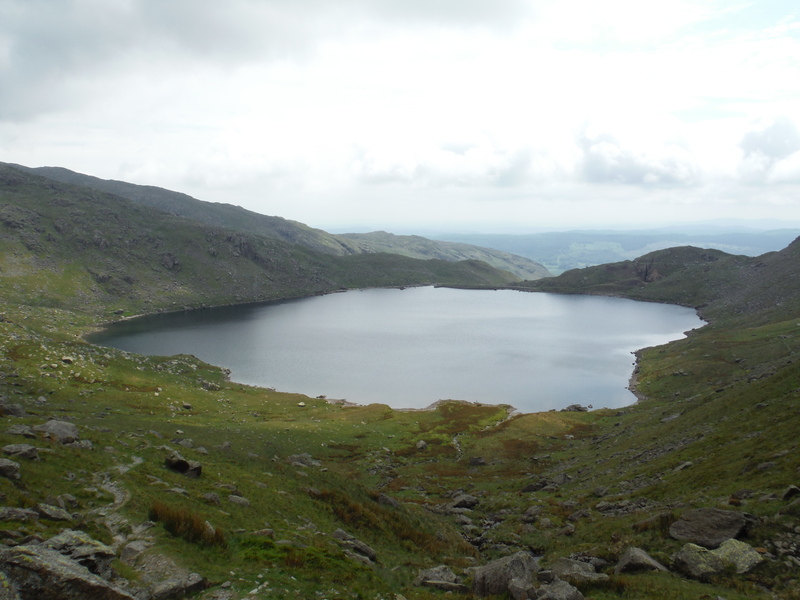 I left my bag at the tip of the tarn and walked along one edge. 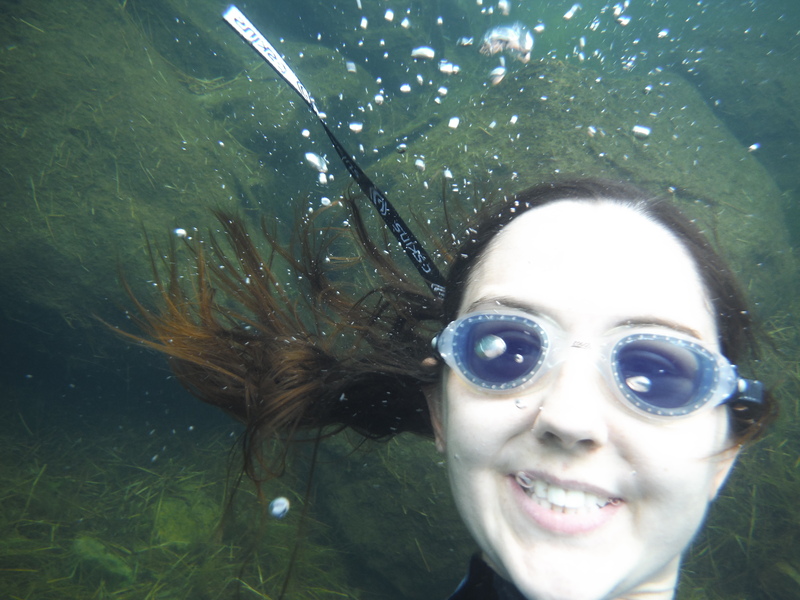 I’d almost got to where I wanted to swim from when I realised that I’d dropped my goggles. I had to walk almost the whole way back before I found them and then back again to my starting place. By now I really wasn’t in a good mood. I finally got into the water and started to swim. And started to calm down. This was why I was here, this was why I was doing all this. A lovely swim, through clear water, with little birds swooping low across the surface and only the sounds of the sheep to disturb me. 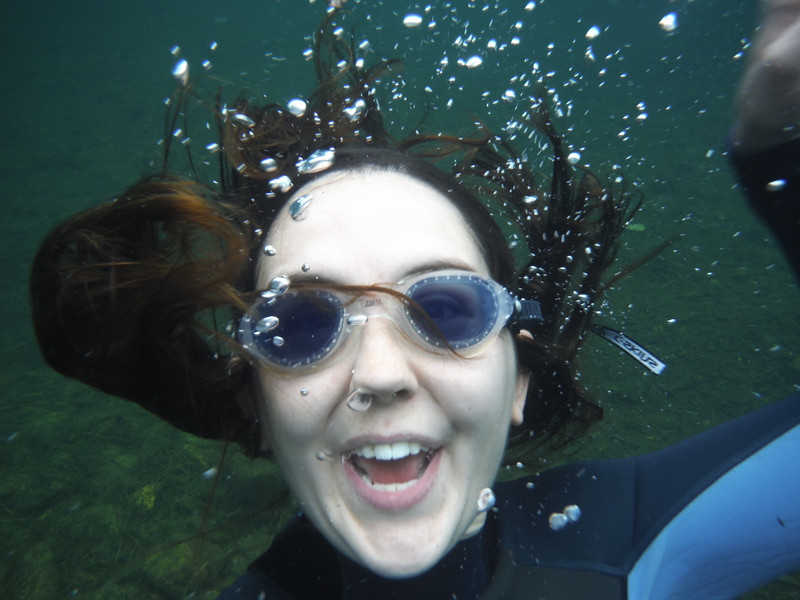 I only put the goggles on for my underwater selfie, too cold. 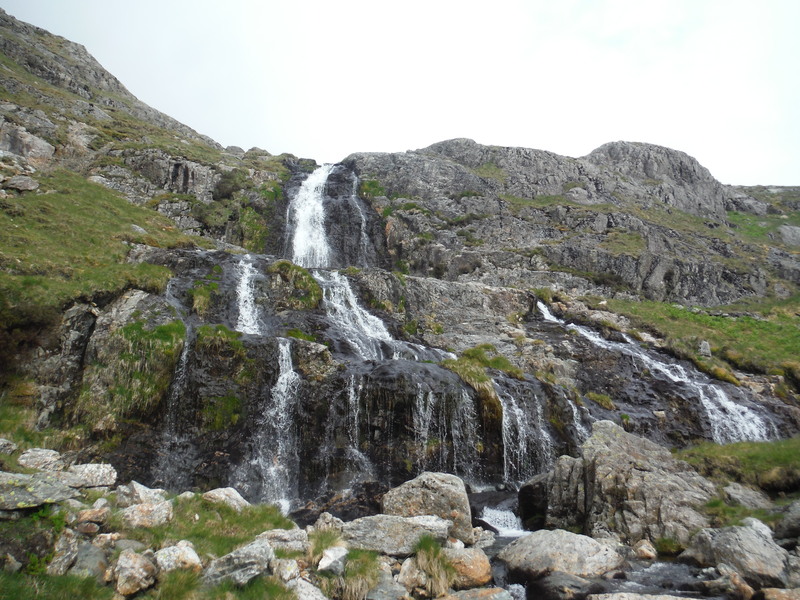 Seathwaite Tarn was followed by another climb back up onto the ridge (having finally found a path) from where I got my first view of Goat’s Water. 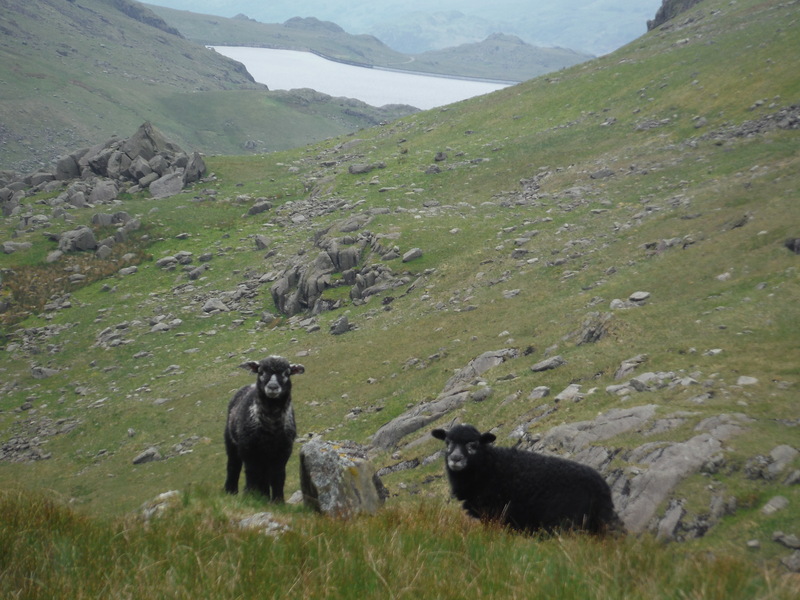 I followed the ridge along and across Dow Crag, Buck Pike and Brown Pike and just as Goat’s Water disappeared, Blind Tarn came into view. I dropped off the end of the ridge and came back round to Blind Tarn, passing through an old slate works with tumble-down buildings. One of them still had rusty tools outside and a frying pan up the chimney. 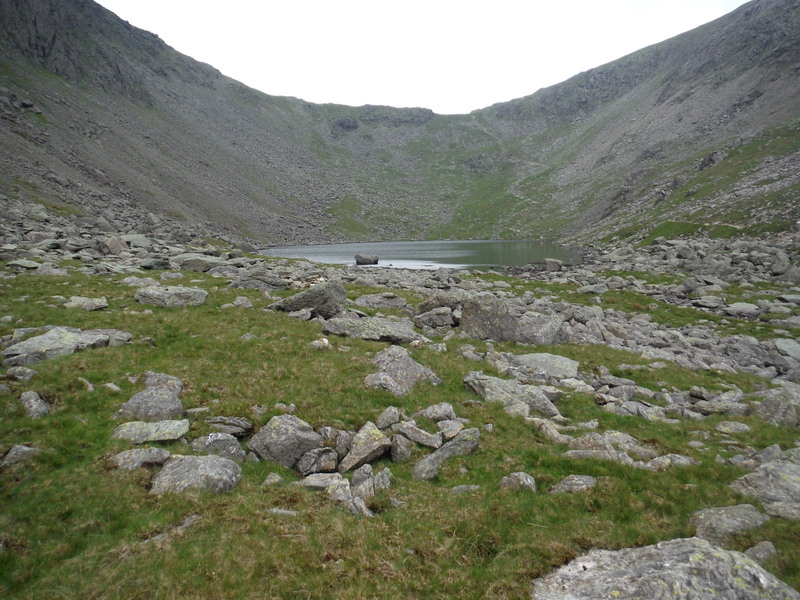 I had a little explore and then headed down to Blind Tarn. Both this and Goat’s Water were overshadowed by the ridge I’d just walked along. 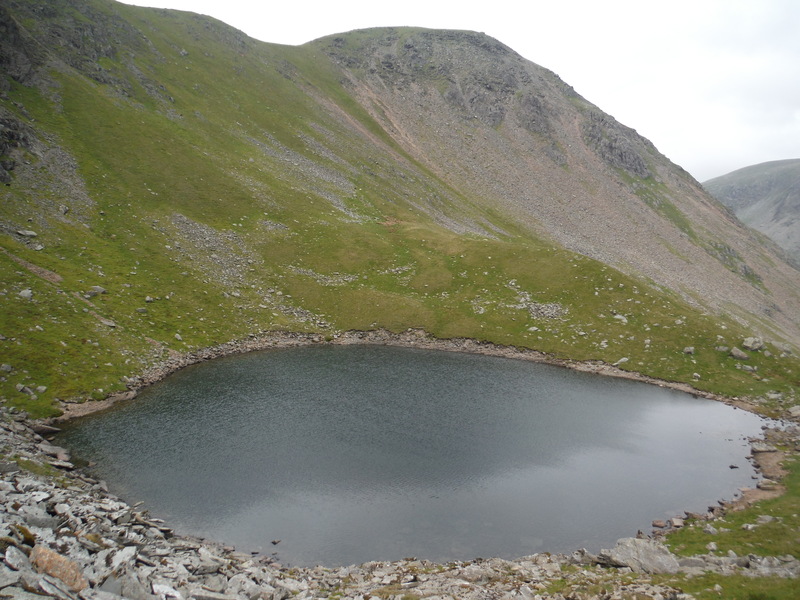 Blind Tarn was only a short swim, but another one that really lifted my mood. I was over half way, the water was lovely I really enjoyed the swim. 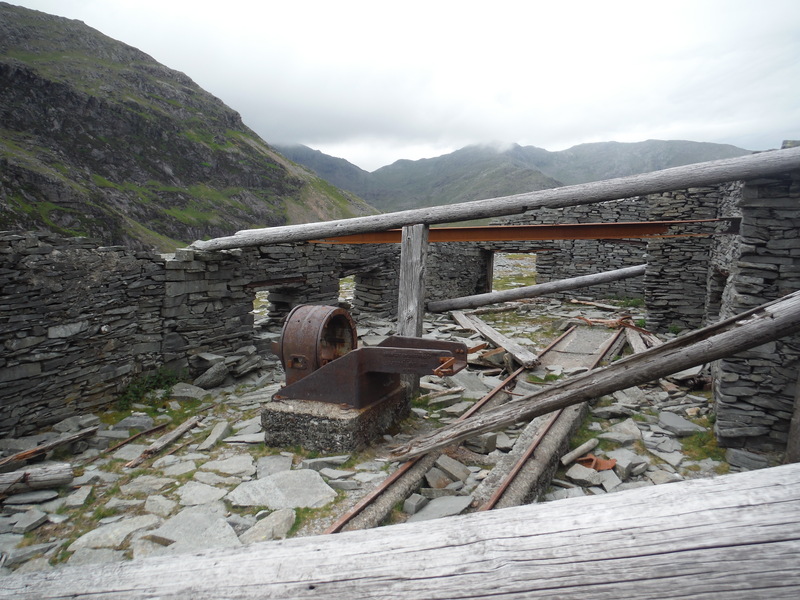 This would be a great place to come for a picnic on a sunny day – explore the slate works and then have a mess around in the tarn. From here I cut across the side of the ridge, following a sheep track that lead me straight to Goat’s Water (thank you sheep!). 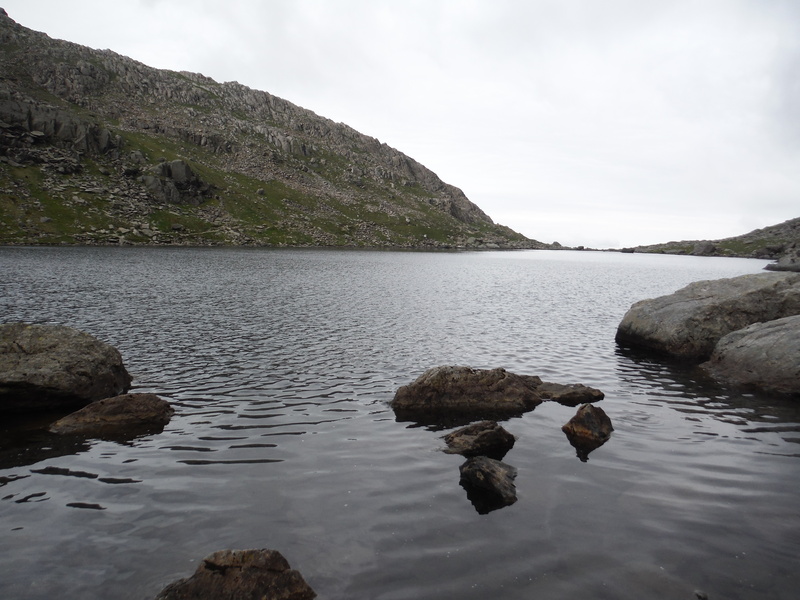 I swam across the top end of the tarn to the background noise of 2 men skidding, sliding and swearing their way down the scree slopes behind me. 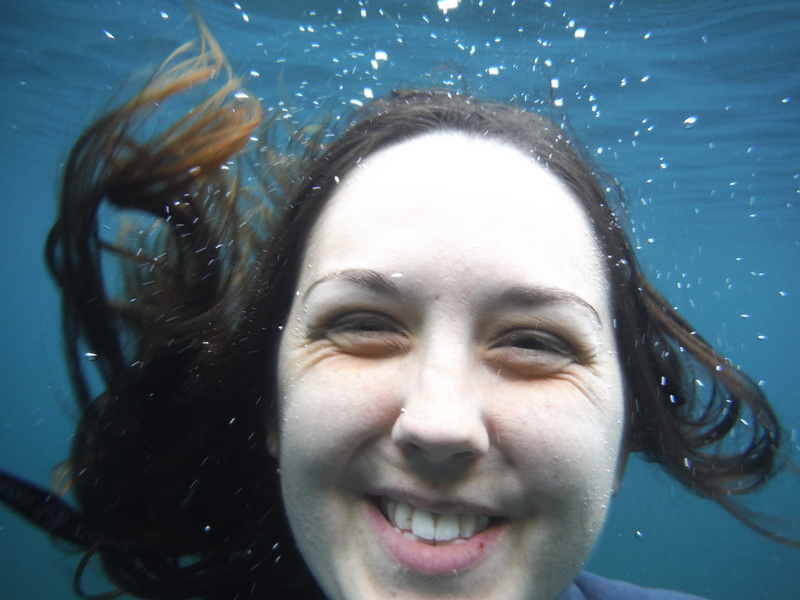 Every swim I did that day the water was beautifully clear and this was no exception. It’s a great place to swim, I would definitely recommend it. 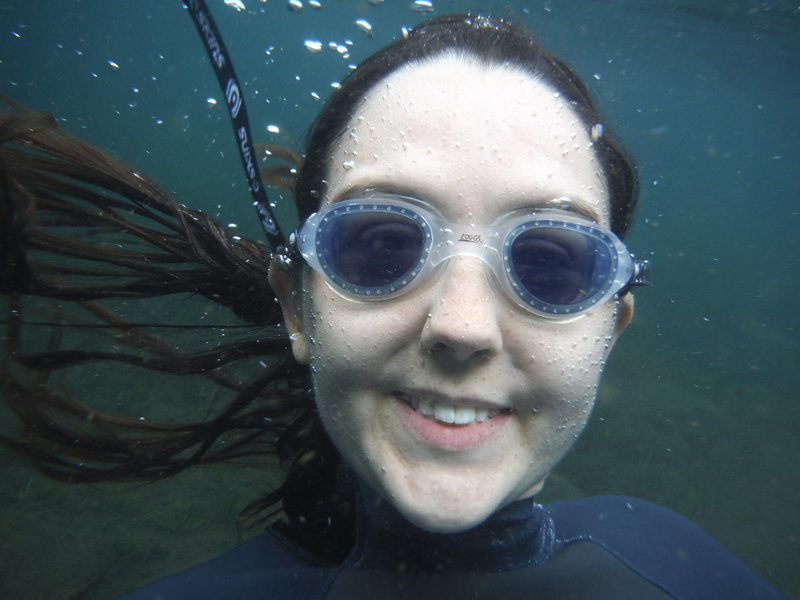 I’d been determined to do 5 swims in one day, but by the time I got to the top of the Old Man it was getting late and I was getting tired and very tired of walking in my wetsuit. I finally made the decision to get changed into my dry clothes and miss out Low Water which was a disappointment but definitely, in the end, the right choice. I walked down past Low Water and though another slate works where there was still a lot of old rusting machinery, really nice to see. There were train tracks and huge steel cables which had fallen across the path. I got back to the hostel at gone 8.30 – I’d been out for 11 hours. I was exhausted but pleased. 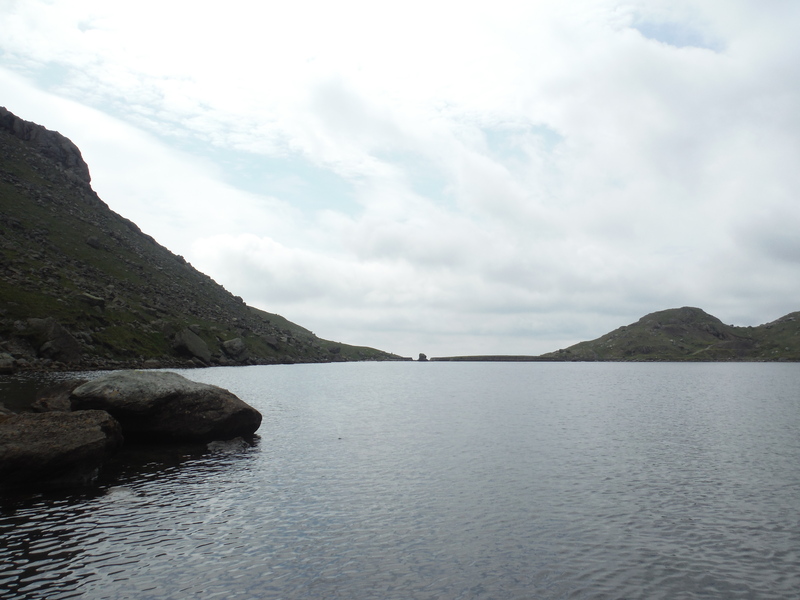 It felt great to do 4 tarns in one day and to walk in a area I don’t know all that well. Now I just have to go back to do Low Water and…. looking at the map next morning I found a tiny tarn I’d missed before: Boo Tarn. It’s on the list.